Though Ottoman coffeehouses had been discovered by English explorers in the early seventeenth-century, debate still continues regarding precisely when and where the first English coffeehouse appeared, though many take antiquarian Thomas Wood’s assertion that coffee was ‘publickly solde at or neare the Angel within the East Gate of Oxon’  in 1650 as one of many signs that Oxford holds a strong claim. The site Wood describes was on Oxford’s High Street and a coffee shop still thrives there to this day. Coffee’s earliest reputation was as a beneficial, yet peculiar and unpleasant feature of the Eastern diet, diplomat George Manwaring’s 1601 description of it representing a fairly typical response: ‘They have a certain kind of drink which they call koffwey […] it is nothing toothsome, nor hath any good smell, but it is very wholesome’ . It can therefore seem quite remarkable just how rapidly coffee consumption grew after the 1650s and how quickly the book trade exploited the popularity of coffeehouses, initially using them as venues for book auctions designed to sell off the libraries of the recently deceased. The first such known auction was organised by the entrepreneurial bookseller William Cooper and took place on 4th December 1682 in Jonathan’s Coffee-House, prominently sited opposite London’s Royal Exchange. The auction consisted of over three thousand lots taken from the library of the late John Humphry, amongst which is listed a Wynkyn de Worde impression of William Caxton’s Vitae Patrum , a text translated by England’s first ever master printer and printed by his immediate successor. The full auction list thus clearly announces an event of both size and prestige, and can be taken as a marker of just how central the coffeehouse was becoming to the world of literary commerce a mere three decades after its introduction to England’s cities . So wrote Henry Savile, courtier and diplomat, to John Wilmot, Earl of Rochester, on 1st November 1677. The ‘Woodstock’ Savile mentions in the letter refers to Rochester’s country residence at Woodstock Park in Oxfordshire, clearly implying that Savile believed Rochester to be the author of a scandalous piece of poetic raillery currently doing the rounds in what was to become London’s most famous coffeehouse. The poem referred to by Savile has never been positively identified, though a likely candidate seems to be Sir Carr Scroope’s In Defense of Satyr , a fashionable imitation of the Roman poet Horace’s fourth satire and an ingenious attack on many of Scroope’s courtly contemporaries. Rochester himself seems to refute any authorship of the anonymous ‘libell’ when he asks Savile to ‘send me a copy’ in his reply; however the mere fact that Savile could associate England’s leading libertine literary figure (described by Andrew Marvell as ‘the best English satirist’) with a venue such as Will’s is telling. Rochester and his hell-raising associates were part of the Restoration aristocracy and, despite their often excessive lifestyle choices and various fallings in and out favour with the King, were serious patrons of the arts. These men saw the coffeehouse as a place outside Charles II’s court in which they could anonymously circulate manuscript fragments of elite, sophisticated, and often dangerous literature. They knew that the cognoscenti of the city frequented the coffeehouse and that it was a place where a reaction from the right sort of people could be provoked. The bond between coffee and books was firmly entrenched by the outset of the eighteenth-century, Will’s and later Button’s coffeehouses being situated just around the corner from the Bow Street shop of Jacob Tonson, London’s biggest bookseller and copy[right] owner. One particular type of literature found its ideal locus of consumption in the coffeehouses of this period: the periodical essay. Owned by old-fashioned private proprietors yet reliant upon the modern mass trade importation of Eastern produce, the coffeehouse physically bridged old and new, private and public, the intimate and the important, in a way which met with Addison and Steele’s Whiggish ambition to redefine sociability and civility for the whole of society through their daily essays on modern living. In the words of coffeehouse expert Lawrence Klein, ‘sociability was seen as [the coffeehouse’s] paramount characteristic […] it was associated not only with private exchange but also with conversation on topics of general interest and public import’ . Sociability was what the eighteenth-century periodical was all about. Its continued existence relied on it being handed on and discussed in coffeehouses. All Accounts of Gallantry, Pleasure, and Entertainment, shall be under the Article of White’s Chocolate-house; Poetry, under that of Will’s Coffee-house; Learning, under the Title of the Graecian; Foreign and Domestick News, you will have from St. James’s Coffee-house . Few understood the link between the coffeehouse and the readership of periodicals more acutely than Joseph Addison. His Spectator No 10 expresses a serious desire to bring philosophy and learning ‘out of Closets and Libraries, Schools and Colleges, to dwell in Clubs and Assemblies, at Tea-Tables, and in Coffee-Houses’ , the ideal coffeehouse and the ideal periodical working in tandem as egalitarian representatives of learning and social betterment. In 1712/13 he personally set up Daniel Button as the proprietor of the all-new Button’s Coffee House in Russell Street, locating it in direct competition with Tom’s Coffeehouse, one of London’s most fashionable haunts. Button’s quickly became known as ‘the Eʃtabliʃhed Wit’s Coffee-House’ , challenging Tom’s as the place to be seen and to discuss the periodicals of the day. 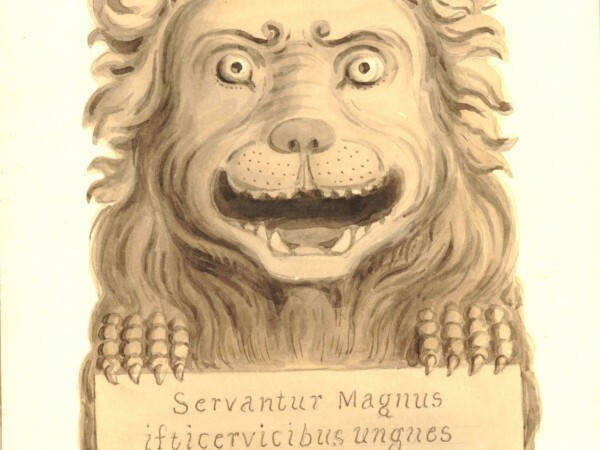 Its famous lion’s-head letterbox, advertised in Steele’s Guardian periodical on 22nd July 1713, encouraged patrons to correspond directly with Addison and Steele, creating an excitingly quickfire and discursive form of literature that must have seemed breathtakingly modern in its time. 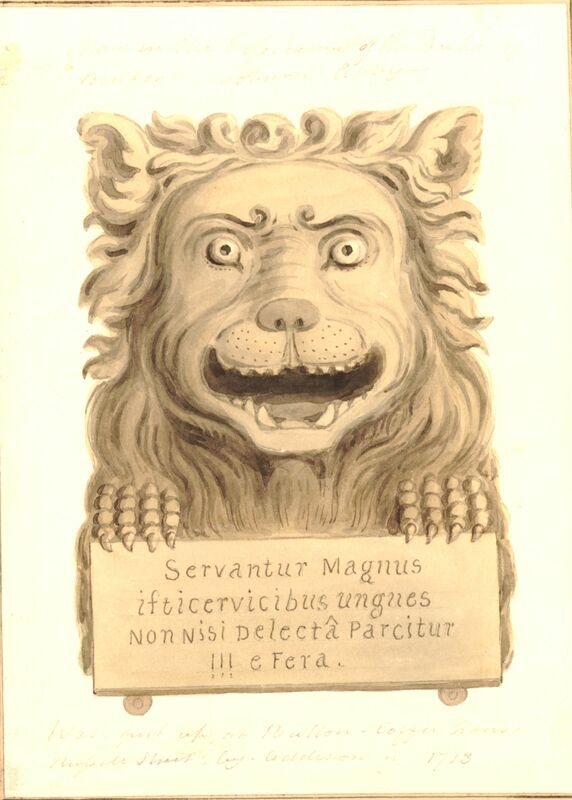 The lion, who could be seen ‘holding its paws under the chin upon the box, which contains everything he swallows’ , also symbolised the dangers of exposing yourself to the claws of a coffeehouse’s critical audience. This was eighteenth-century social networking, easy and appealing but not without consequence. If Addison envisaged the ideal coffeehouse as a kind of urban university where learning and philosophy would be civilly debated, the reality rarely lived up to his standard. The Coffeehouse was often a noisy, raucous, smoky rumour-mill and contemporary writers such as Alexander Pope portrayed its produce as dangerously intoxicating. It was a place where another form of less reputable literature could thrive alongside the periodical essay: the novel. The top purveyor of sensationalist fiction in the early half of the century was Eliza Haywood, and it is worth noting that the 1724 imprint of her Spy Upon a Conjuror lists the work as being available for purchase ‘at BURTON’S Coffee-House, Charing-Croʃs’. In general terms, it makes perfect sense for a coffeehouse to sell a Haywood novel. Their plots often pivoted on the kind of gossip and scandal overheard in such establishments . There may, however, be a more specific reason why Burton’s in particular was an ideal vendor for Haywood’s latest tale of urban espionage. It was from this coffeehouse that the House of Lord’s had accused the infamous George Kelly of receiving treasonable letters in support of what became commonly known as the Atterbury Plot, a failed conspiracy to re-establish the exiled Jacobite court . Kelly’s speech at his trial (in which, we must note, he specifically denies receiving any such letters at Burton’s) was sensationally published in 1723 and proved a popular enough read to run to four editions within the year. Were Haywood and her associates capitalising on the talk of underground activities associated with Burton’s in order to sell more volumes? What might be added to this illustrious shelf during the decade of the Good Humour Club? 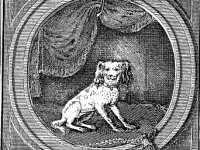 Inspired by his literary hero Henry Fielding, Francis Coventry wrote his first and only satirical novel in 1751. Entitled The History of Pompey the Little , it portrayed every broad and instantly recognizable character type of mid eighteenth-century comedy, from the mad and feeble aristocracy of Pall-Mall down to the coarse world of “new money” (aspiring traders pejoratively known as “cits” due to the location of their trade shops in the City of London). What set this work apart was that its central protagonist was a Bologna lap dog whose various adventures being lost, sold and exchanged made him capable of interacting intimately with every rung of society in a way in which no one human being could ever hope to do. The novel was a revelation, an immediate hit, and sparked a short lived fashion for “it” narratives written from the point-of-view of objects exchanged by various people. At its heart is a scabrous portrayal of coffeehouse culture. Our hero Pompey, having been exchanged for nothing more than ‘a Dram of Brandy,’ comes to live in and wander daily through a typical London coffeehouse. There he is able to surreptitiously listen in to the conversations and disputes that arise between every type of professional and every walk of life, ‘for here assembled Wits, Critics, Templars [eighteenth-century barristers], Politicians, Poets, Country Squires, grave Tradesmen, and sapient Physicians’. What he discovers, however, is a bunch of self-styled “critics” who praise ‘the lowest Ribaldry of a dirty News-Paper’  as wit, asinine political radicals who make embarrassingly ill-informed soapbox speeches, and miserly councillors who sit in stony silence as they read the free newspapers. Everyone has their own agenda, everyone has their own speech to make, and nobody listens to anybody else. 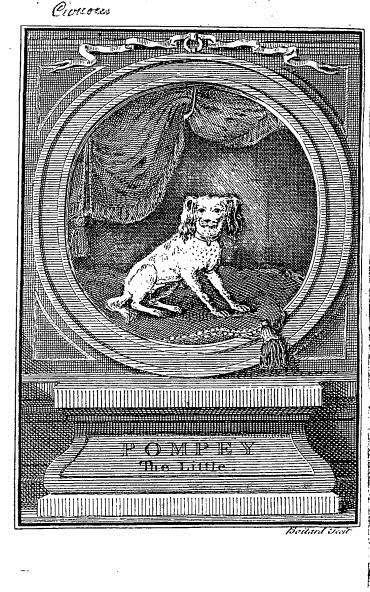 Pompey the Little is the kind of popular picaresque prose tale that undoubtedly would have been at home sitting on a coffeehouse’s shelf, yet its acerbic criticism of the coffeehouse’s motley clientele calls into doubt the very nature of eighteenth-century sociability. This is coffeehouse literature that questions the values of its own readership, and asks them to ponder what they gain from going to their favoured haunt day-in day-out. Coventry was not the only critic of the modern urban form of sociability embodied by the coffeehouse. Essayists were still selling their opinions in 1759, with Oliver Goldsmith’s single volume edition of The Bee published that year in a handy octavo format perfect for circulating around coffeehouses. Johnson’s Rambler essays of the early 1750s had re-established the fashion for essayistic personae and had done reasonably good business in the provincial trade outside of London. The ever-struggling Goldsmith was now aiming to enjoy similar success. Johnson, typically never lost for words, displays his own concern over the value of modern urban culture when he writes in a private letter to Bennett Langton dated 6th May 1755 of his disdain for the gangs of have-a-go literary ‘criticks’ that plagued the eighteenth-century coffeehouse: ‘[their] outcries are soon dispersed into the air, and are thought on no more’ . Goldsmith chose to publically air his own concerns in his Bee essay entitled ‘Happiness, in a Great Measure, Dependent on Constitution’. His was a gentler, more melancholy response to the loss of the simple rural pleasures of his youth, with the modern city’s entertainments merely a pale imitation of the former’s purity: ‘The pleasure Garrick gives can no way compare to that I have received from a country wag who imitated a quaker’s sermon’ . Focusing on the idea that a man’s happiness was largely reliant upon his predominant disposition (or “Humour”), Goldsmith describes how his present enjoyments may be more refined, ‘but they are infinitely less pleasing’  than those of his time in the country. The coffeehouse offers high culture and the company of sophisticates, but ultimately its heady cocktail of urban amusement merely sours Goldsmith’s disposition as he nears middle age. What, we might well ask, would the Good Humour club have made of Goldsmiths reflections had The Bee flown its way into Sunton’s York establishment? But can we really end our story of the bookshelf on a downbeat note? Clearly coffeehouses were beneficial to a bustling trade in literature and knowledge, and many important London traders such as Richard Franklin moved from the traditional booksellers locale around St Paul’s in order to get closer to the key West End houses . As we arrive at Sunton’s in York towards the end of the 1750s, undoubtedly the proprietors of such establishments did provide a valuable service to their customers, and Johnson’s simple dictionary definition of the coffeehouse makes it clear that it was synonymous with urban entertainment and the free availability of news: ‘A houʃe of entertainment where coffee is ʃold, and the gueʃts are ʃupplied with newspapers’  Joseph Sunton was likely to be an active member of his community. 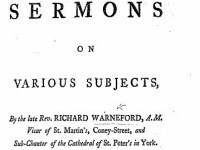 We know he exercised his freeman’s right to vote, and publicly subscribed to Caesar Ward’s (publisher of the York Courant newspaper) edition of Sermons on Various Subjects by Richard Warneford, the late reverend of St Martin’s. These sermons were beautifully presented in two octavo volumes, printed in an elegant fount and accompanied by fine woodcut ornaments. Clearly Sunton was happy for his name to feature in the subscription list, which was included in the prefatory matter of the first of volume . His appearance on such a list would have proclaimed him as a man of piety, a patron of learning, and a proprietor of reasonable financial success. Though it was common for coffeehouses to make a miniature library of papers, pamphlets and assorted literature accessible as part of their entrance fee, we can only speculate on whether Sunton placed these two volumes upon a shelf for his patrons to take down, read from, and recite aloud. I like to think he may well have done, and that a little of Joseph Addison’s ideal of the coffeehouse as a modern site of learning and public improvement might just have survived in mid eighteenth-century York.